Although granite and marble are very similar in appearance, there are many underlying factors that may make one more suited to your application than the other. The main differences are in the porousness, softness and durability of each stone. Visually it is pretty easy to distinguish between marble and granite. Granite usually consists of many different colors because of its crystalline composition. Marble, however is mainly one color with varying veins of different colors. Granite comes in a wide variety of colors and patterns, while marble offers a range of lighter shades. Granite is one of the most popular choices for kitchen counter tops and comes in a wide variety of colors with natural sedimentary veins. There are many different minerals within a granite slab that appear like small flecks of varying colors. The stone is naturally durable and can be polished or finished in many different ways. The main benefits of granite are it's resistance to water, heat, scratches and stains. Of the most common kitchen counter top materials, granite is second to stainless steel in bacteria resistance. Like any solid surface, a high-impact blow can damage granite, although it is resistant to cracking under normal use. Commercially, most stones that can be polished are referred to as marble including; travertine, limestone and serpentine. These stones vary slightly from actual marble in means of their composition. Marble comes in a variety of colors to fit any home décor, and features a similar variety of veins. Marble is a very hard natural stone, but it needs to be protected from spills and stains more than granite does. Etching happens when acid comes into contact with polished marble or any limestone surface. The chemical reaction removes the polish. Although marble does share the same heat resistant qualities as granite, it is not a scratch resistant stone. Statewide Stone Care is a professional natural stone restoration company with years of quality service. We offer marble care services NYC to ensure that your marble will last a lifetime. 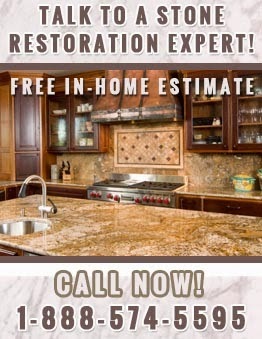 Statewide Stone Care also specializes in restoration and granite care services in NYC. If you have any questions about any of our stone care services in NYC, call Statewide Stone Care today and speak with one of our natural stone care professionals.